I am going to be honest with you here. I am not a summer girl. Never have been and never will be. I’d happily trade endless hours in the sun for a cozy afternoon cuddled up next to the fire. I’d forgo splashing around at the beach to enjoy a meandering walk through the snow. I will happily take warm wooly sweaters over a skimpy bikini any day. That being said, there is something so magical about warm-weather food. Everything is bright and fresh and really just full of life. The tomatoes really taste like tomatoes. The strawberries burst forth with sweet, juicy flavor. The peaches leave lovely little lines of sticky, honeyed juice trailing down my chin. It’s hard not to become overjoyed and overwhelmed by the beauty and abundance of a summer farmers’ market. There are just so many options. It can be tempting to dig right into these irresistible food stuffs, and it is certainly easy. But sometimes just a teeny bit of effort is so rewarding and leaves you with something even more delicious than what you started with. And while the weather is, ahem, so very warm, being scantily clad is sort of par for the course. Which means those hearty (and not always so healthy) stews and casseroles of chillier months are not really the best option when we’re trying to pour ourselves into itty bitty dresses and barely-there bathing suits. So, hunker down for a filling, fresh, and light summer meal that will leave you happy and satisfied, minus the bloat. To make the carrot salad: Heat olive oil in a large skillet. Add carrots, sliced garlic, and red pepper flakes. Cook until carrots are just wilted, about 4 minutes. Season with salt and pepper. To assemble the tacos: Spread guacamole and salsa over each of the tortillas. Divide black beans between tortillas. Divide carrot salad between tortillas. Add cilantro. Roll, cut in half, and enjoy with spicy blue corn chips. Thanks for the new taco idea. Sounds really good. 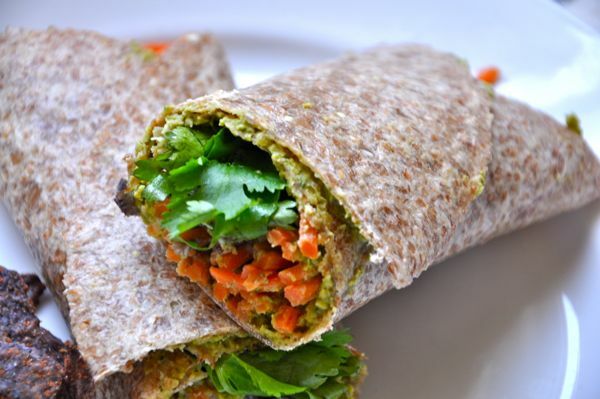 I love to use the sprouted whole grain tortillas as personal size, thin crust pizza. I use a light cover of pesto as my sauce then I just pile on what ever veggies I may have. My favorite is when I use sweet bell peppers, asparagus and fresh spinach. I sprinkle a little cheese on top and bake for 10 minutes at 350. Scrumptious!